Harry B. Barrett was born on May 29, 1922. He was raised on a farm located at Lot 12, Concession 3, in the former Township of Woodhouse. He attended both public and high school in Norfolk County. After high school, he joined the Ontario Experimental Union. Harry B. grew experimental plots – root crops as well as barley and oats to test their adaptability and compatibility to Norfolk County conditions. Upon returning to civilian life after serving in the Second World War, Harry joined his father in managing a 600 acre farm. They maintained a herd of purebred milking Shorthorns, purebred Shropshire sheep, Barred Rock chickens for meat and eggs, and Yorkshire hogs. They also had a 7,000 bird broiler operation. Crops included hay, grain, corn, soybeans and 60 acres of managed woodlots. Harry attended the Ontario Agricultural College in Guelph where he graduated with an Honour Bachelor of Science of Agriculture in Animal Husbandry in 1949. In 1959, Harry joined the staff of the Hagersville High School as a Science and Agriculture teacher. Two years later, he became the Head of the Agricultural Department at Simcoe Composite School. He was appointed to the Provincial Agricultural Committee and was instrumental in developing post-secondary curriculum for a province-wide Environmental Science course. As a youngster, Harry was very involved in 4-H. As an adult, he continued to serve as an instructor as well as a judge for 4-H and Junior Farmer activities in both Norfolk and Haldimand Counties. Early in 1968, Harry was appointed to the Fanshawe College Advisory Committee where he investigated the feasibility of a Farm Business course in Norfolk which was implemented the fall of that same year. Harry was soon offered a teaching position with Fanshawe College. He taught Crop Production and developed a comprehensive course on tobacco in Ontario, dealing with all aspects of the crop from greenhouse management to harvest. He soon became the Principal of the Norfolk School of Agriculture, at the Simcoe Campus of Fanshawe College. As principal, Harry established a two week student exchange scholarship with the Norfolk School of Agriculture in the U.K.
Harry is an ardent advocate for conservation. He was a founding member of the Long Point Foundation of Conservation. As Foundation President, he helped to establish the Long Point World Biosphere Reserve. 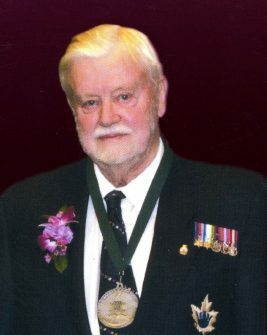 He was the founding President of the Norfolk Field Naturalists and has been involved with the Federation of Ontario Naturalists, Long Point Bird Observatory, Bird Studies Canada, Ontario Forestry Association, Ontario Institute of Agrologists, Ontario Heritage Foundation and the Ontario Conservation Council, to name a few. Beginning in 1978, Harry served six years as a provincial appointee to the Long Point Region Conservation Authority, chairing the Education Committee. He was responsible for drafting a motion that led to special management of the Backus woodlot and the eventual ownership by the Nature Conservancy of Canada. Harry is also a noted author. He has written numerous nature columns for local newspapers and has penned 16 books. The library and reading room at the Port Dover museum was dedicated in July 2017.